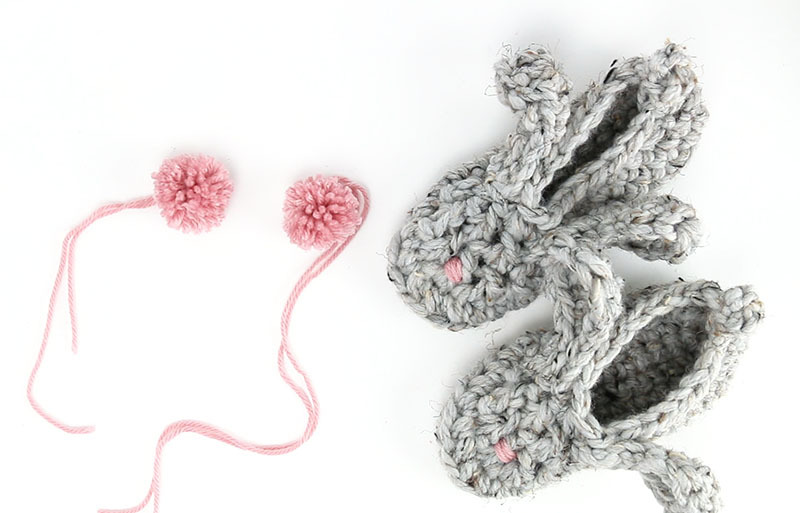 Learn how to make adorable kids bunny slippers with this free Crochet Bunny Slippers Pattern! Written pattern and video tutorial included. This post contains affiliate links, which help to support this site. Thank you! I have the cutest little crochet pattern for you all today. These sweet little crochet bunny slippers are a perfect little project to make for your kids, grandkids, nieces and nephews, or any cute little kids in your life. 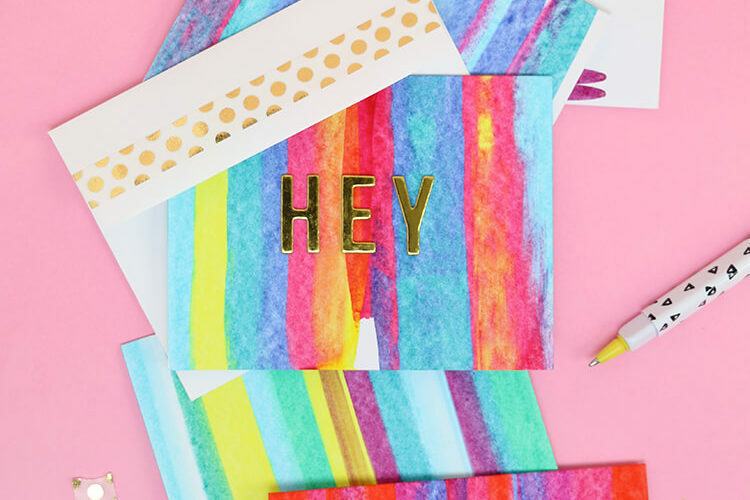 They are great for year round, but would be especially cute tucked into an Easter basket, don’t you think? The pattern is available in five sizes ranging from a Toddler 5/6 to a Kids 2/3, and I have made a video tutorial for the pattern as well that you can check out at the end of this post or on my youtube channel. Half Treble Crochet (htr) – This stitch is in between a double crochet and treble crochet in height. To make the stitch, yarn over twice as if beginning a treble crochet stitch, insert hook into work, and draw up a loop (four loops on hook). Yarn over and draw through two loops (three loops on hook), and, finally, yarn over and draw through all three remaining loops. Single Crochet Two Together (sc2tog) – Insert hook into stitch and draw up loop. Insert hook into next stitch and draw up loop (3 loops on hook). Yarn over and draw loop through all 3 loops. 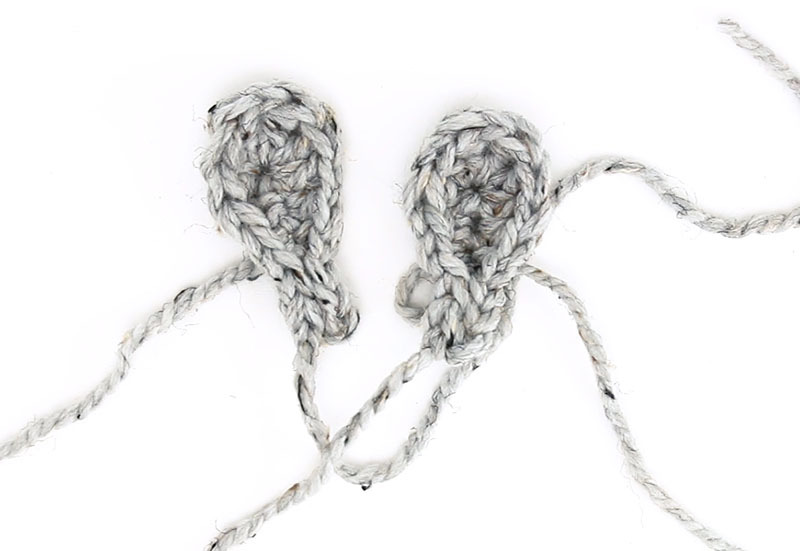 Double Crochet Two Together (dc2tog) – Yarn over, insert hook into stitch and draw up loop (3 loops on hook). Insert hook into next stitch and draw up loop (4 loops on hook). Yarn over and draw loop through first 3 loops (2 loops on hook). Yarn over and and draw loop through remaining 2 loops. Rnd 1: Ch 9, sc in 2nd ch from hook, 6 sc, 3 sc in last ch, turn and work the following stitches back around the other side of the chain, 6 sc, 2 sc in last ch, sl st to first sc to join (18 sc). Rnd 2: Ch 2 (counts as hdc), hdc in same st, 3 hdc, 3 dc, 2 dc in next st, 3 dc in next st, 2 dc in next st, 3 dc, 3 hdc, 2 hdc in each of next 2 sts, sl st to join. Rnd 3: Ch 1, working in back loops only, sc in each st around, sl st to join. Rnd 4: Ch 1, sc in same st, 6 sc, sc2tog, 4 dc2tog, sc2tog, 7 sc, sl st to join. Rnd 5: Ch 1, starting in same st, sc2tog, 3 sc, sc2tog, 2 dc2tog, sc2tog, 3 sc, sc2tog, sc, ch 6, sl st to same st, sl st to first sc2tog to join. Finish off. Weave in ends. Rnd 1: Ch 10, sc in 2nd ch from hook, 7 sc, 3 sc in last ch, turn and work the following stitches back around the other side of the chain, 7 sc, 2 sc in last ch, sl st to first sc to join (20 sc). Rnd 2: Ch 2 (counts as hdc), hdc in same st, 4 hdc, 3 dc, 2 dc in next st, 3 dc in next st, 2 dc in next st, 3 dc, 4 hdc, 2 hdc in each of next 2 sts, sl st to join. Rnd 5: Ch 1, starting in same st, sc2tog, 4 sc, sc2tog, 2 dc2tog, sc2tog, 4 sc, sc2tog, sc, ch 6, sl st to same st, sl st to first sc2tog to join. Finish off. Weave in ends. Rnd 1: Ch 11, sc in 2nd ch from hook, 8 sc, 3 sc in last ch, turn and work the following stitches back around the other side of the chain, 8 sc, 2 sc in last ch, sl st to first sc to join (22 sc). Rnd 2: Ch 2 (counts as hdc), hdc in same st, 5 hdc, 3 dc, 2 dc in next st, 3 dc in next st, 2 dc in next st, 3 dc, 5 hdc, 2 hdc in each of next 2 sts, sl st to join. Rnd 5: Ch 1, starting in same st, sc2tog, 5 sc, sc2tog, 2 dc2tog, sc2tog, 6 sc, sc2tog, sc, ch 6, sl st to same st, sl st to first sc2tog to join. Finish off. Weave in ends. Rnd 1: Ch 13, sc in 2nd ch from hook, 10 sc, 3 sc in last ch, turn and work the following stitches back around the other side of the chain, 10 sc, 2 sc in last ch, sl st to first sc to join (26 sc). Rnd 2: Ch 2 (counts as hdc), hdc in same st, 6 hdc, 4 dc, 2 dc in next st, 3 dc in next st, 2 dc in next st, 4 dc, 6 hdc, 2 hdc in each of next 2 sts, sl st to join. Rnd 5: Ch 1, starting in same st, sc2tog, 4 sc, sc2tog, 2 dc2tog, sc2tog, 4 sc, sc2tog, sc, sl st to join. Rnd 6: Ch 1, sc in same st, 7 sc, 3 sc2tog, 8 sc, ch 6, sl st to same st, sl st to join. Finish off. Weave in ends. Rnd 1: Ch 16, hdc in 3rd ch from hook (two skipped chs do not count as hdc), 12 hdc, 3 hdc in last ch, turn and work the following stitches back around the other side of the chain, 12 hdc, 2 hdc in next ch, sl st to first hdc to join (30 hdc). Rnd 2: Ch 2 (counts as hdc), hdc in same st, 7 hdc, 5 dc, 2 dc in next st, 3 dc in next st, 2 dc in next st, 5 dc, 7 hdc, 2 hdc in each of next 2 sts, sl st to join. Rnd 5: Ch 1, starting in same st, sc2tog, 9 sc, sc2tog, 2 dc2tog, sc2tog, 9 sc, sc2tog, sc, sl st to join. Rnd 6: Ch 1, sc in same st, 9 sc, sc2tog, dc2tog, sc2tog, 10 sc, ch 6, sl st to same st, sl st to join. Finish off. Weave in ends. There are two ear sizes. Use the small ears for sizes Toddler 5/6 – 10/12. Use the large ears for sizes Kids 13/1 – 2/3. Rnd 1: Ch 6, sl st in 2nd ch from hook, sl st, sc, hdc, (2 dc, htr, ch, htr, 2 dc) all in last ch, going back the other way on the other side of the chain, hdc, sc, 2 sl st. Finish off leaving a long tail for sewing ear to slipper. Rnd 1: Ch 7, sl st in 2nd ch from hook, 2 sl st, sc, hdc, (2 dc, htr, ch, htr, 2 dc) all in last ch, going back the other way on the other side of the chain, hdc, sc, 3 sl st. Finish off leaving a long tail for sewing ear to slipper. When you have two slippers, and two ears, you are ready to assemble your slippers. Find the center stitch on the toe of your slipper and place one ear to the side. 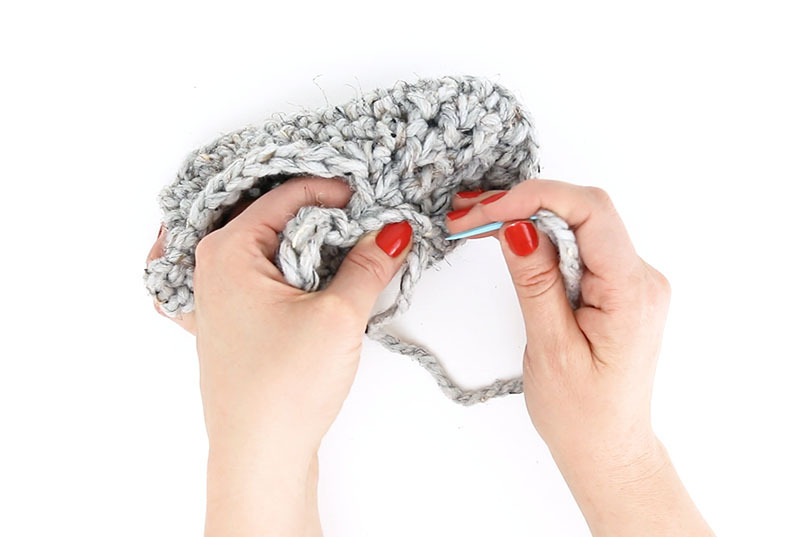 Use the long tail and your yarn needle to sew the ear in place. When you have your ears sewn on, you can finish off your crochet bunny slippers with a cute little nose and pom pom tail. Thread your yarn needle with a worsted weight yarn in a contrasting color, and wrap it around one of the center stitches on the toe. When you are happy with your stitches, tie off the yarn with a double knot and weave in the ends on the back side. 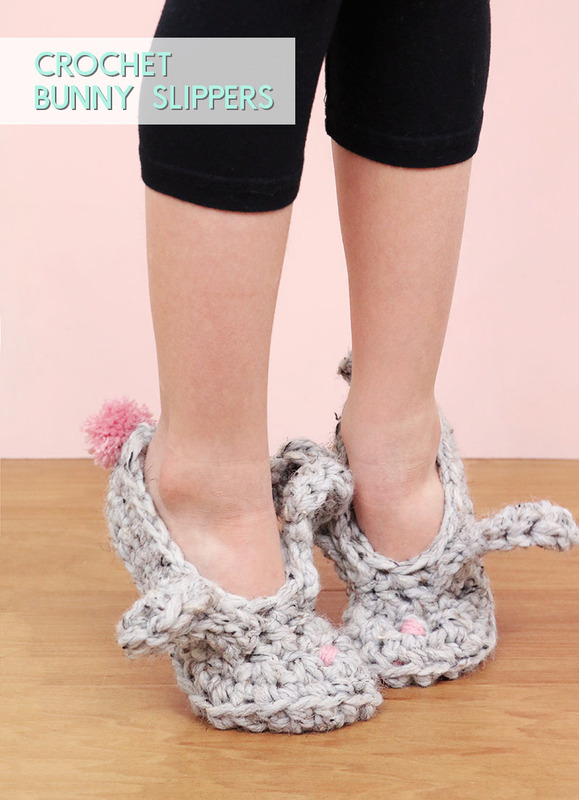 Finally, you finish off the slippers with an adorable pom pom tail. I used a small Clover pom pom makers to make my pom poms, but feel free to use whatever method you like (learn how to make pom poms with just your fingers here if you don’t have a pom pom maker). Leave long tails when you make your pom poms – you will use these to attach the pom poms to the heel of the slippers. Tie them on with a double knot and weave in the ends. And that’s it! Your sweet little crochet bunny slippers are all ready for gifting, wearing, and hopping around. Don’t forget to check out the video tutorial for the pattern HERE. 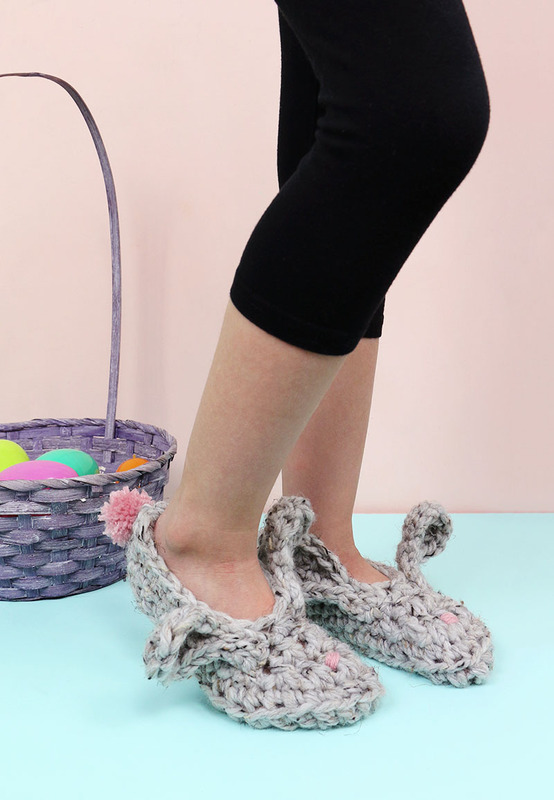 If you make your own crochet bunny slippers, I want to see them! Share your photos to my facebook page or tag me on instagram or twitter (@persialou), and don’t forget to use the hashtag #persialou for a chance to be featured. How do I make it adult sized? 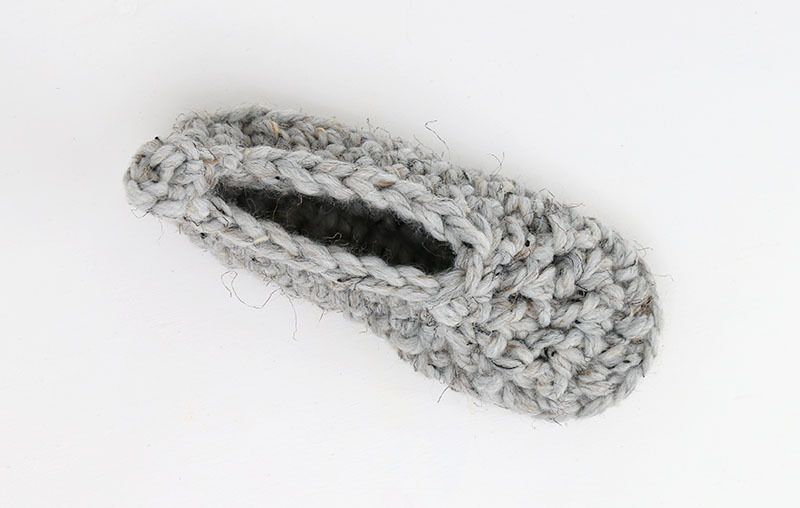 There are some adult slippers on ravelry. We can make one and then put the ears from this pattern to get our bunnies. I agree. How do I make adult size? Oh my goodness Alexis, these are just adorable! My daughter would love for me to make her some – she just saw the picture. Super cute!! I’m trying to make the 13/1 like you show in your YouTube video. In the instructions above you say to chain 13. I would think a chain of 12 would be better in order to start with the 2nd chain from the hook and come up with 26 stitches. Am I wrong? I chained 12 and it came out correctly with 26 stitches. I have just found you on YouTube so I’m new to your style of crochet.